walking tour around the village. If there’s a let up from the rain over the weekend, why not take the chance to get out for a walk around Rainford exploring the rich heritage of the village? Download and print the walking tour leaflet in A3 or A4, and take a trip around the village. This walk follows pavements and footpaths around the village, solid footwear is advised, and take care where footpaths get narrow, especially in the Reeds Brow area. The walk will take around one and a half hours, and covers about 3.5miles or 5.5km. Walking this route will burn around 250kcal, about equivalent to a chocolate bar! Being guided around the stores. “Two dozen members of the Rainford’s Roots group took the opportunity to visit the Museum of Liverpool’s storage facility located in deepest north Liverpool. Led by Exhibition Curator, Liz Stewart and accompanied by Kerry and Sam, we were taken on an interesting and impressive tour of the stores. We were surprised to learn that the c.700 items on display in the museum constitutes less than one per cent of the total archaeology collection! First was the Land Transport store room where we saw bicycles, bath chairs, carriages from Croxteth Hall and a superb Vulcan Car made in Southport early in the 20th century. Next we climbed the stairs to the Antiquities section which holds artefacts from all over the world. The high point of our visit was on the top floor where the regional archaeology finds included those from Rainford. We were allowed to handle some of the pottery from Rainford, including the flared cups of early post medieval age (i.e. Elizabethan), and an imitation German stoneware cup. Alongside these were similar finds from Prescot including a very large storage jar. There was also more elaborate pottery from Buckley in North Wales with raised slip decoration and sgraffito where the decoration is scratched through the slip revealing the glaze underneath. How to analyse c. 8,000 clay pipe fragments from Rainford. By volunteer Emily G.
A mound of pipe stems! 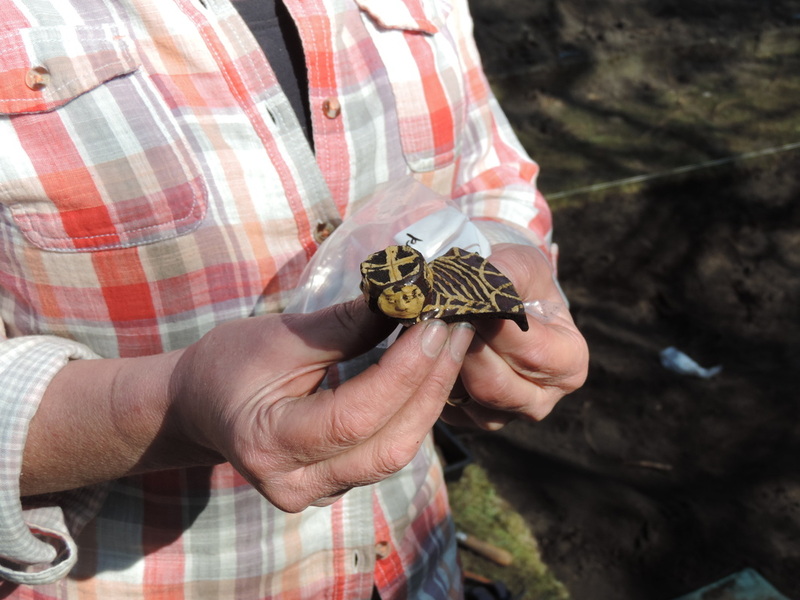 One of our volunteers shares her insights into the world of clay tobacco pipe recording! Step 1. Gain a goodly amount of previous experience with analysing clay tobacco pipes, to be of maximum help to your old university friend and Project Officer. Step 2. Share out the bags of clay pipe stems between you. All the pipe fragments had already been roughly sorted into stems, bowls, and anything encrusted with metallic kiln-waste. Now the detailed sort begins! This is going to take a lot longer than you might imagine. Step 3. Study each tiny fragment for the smallest signs of decoration or markings; fingerprints (what an exciting connection to the pipe maker); larger bore-holes (which often means an earlier pipe); glaze; more kiln-waste; and in general anything unusual. Each time a bag of stems is finished, they are counted, weighed, and entered into the Rainford catalogue. The total stem count is around 6,800! Step 5. Work out a typology for the bowls. Essentially this means seeing what shapes are most common, and which are variations of other shapes. It can help an archaeologist decide how many moulds were being used to make the pipes ... and it can also drive an archaeologist mad. Squinting and trying desperately to match up the profiles of bowls is a recipe for indecision! Step 6. Once you've figured out your typology, begin sorting the other bowl fragments - if any pieces are big enough to match into the typology, hurrah. If not, examine them closely for any sign of decoration. This takes a full day. Step 7. Begin to recognise the most common patterns on bowls. Basket-weave, fluted lines, lines around the rim, leaves or wheatsheafs running up the back and front of the bowls. .. Step 8. Become fascinated by the weirder patterns. This is the best bit! Buffalo horns - Freemason symbols - a sunburst! Sometimes the patterns are so eroded or fragmentary they're unidentifiable: sometimes they're clear and well-preserved but you don't know what on earth they mean! Step 9. Count, weigh, catalogue - just like with the stems, but it takes much longer because so many more bits of bowls are decorated, and need more detailed description. This takes until the end of the week, and the job is barely half-done by then. Step 11. Don't forget to dream about clay pipes and see them every time you blink! Essential step, this. Step 12. And have fun. It's the ordinariness of clay tobacco pipes that make them so interesting. They're not as glamorous as some finds, or as exciting as the actual process of excavation, but they were made and used in everyday life for hundreds of years, and so they can bring you very close to the past. School Sessions: encouraging the next generation of archaeologists! School sessions. ©National Museums Liverpool. As a second year student at the University of Liverpool, I have been given the opportunity to spend Wednesdays on a placement at the field archaeology unit at National Museums Liverpool. We have been involved in a range of activities during our time here, including research tasks and finds processing. We have been able to see a lot of the work going on ‘backstage’ at the museum and it has been a really informative experience, as well as providing new skills and understanding. This morning (Wednesday, 27 November 2013), we helped at a session for local school children. The aim was to give the children an idea of the kind of things archaeologists are involved in, beyond digging trenches and discovering artefacts. The children took part in activities such as choosing the kind of items an archaeologist might use in the field, sorting and recording finds and learning how to use maps as well as having a go at digging in a ‘mock’ trench before hand. The children were all very enthusiastic throughout the session and seemed very keen to learn as much as they could on all aspects of the archaeologist’s work, not afraid to get as hands on as possible. They all seemed to thoroughly enjoy their time being taught all about work being done while being able to handle artefacts and try their hands at some of the tasks themselves. I believe that the archaeology sessions for school children are an excellent idea; I know that I would have jumped at the experience when I was in primary school. Giving the children a full view of all the kinds of things that archaeologists need to do before and after field work gives a well rounded view of the work and potential career as a whole. Now that Indiana Jones has hung up his hat and his whip, the more of these sessions to encourage younger children into archaeology we have the better. 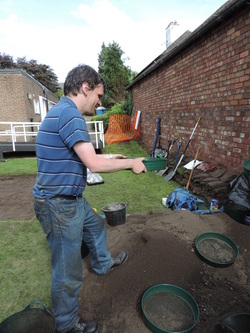 Rainford’s Roots volunteer Glyn shares his tongue-in-cheek views on community archaeology! Mine is a cautionary tale of curiosity and the place it can lead you to. My name is Glyn and I work for National Museums Liverpool. I came to this project some 12-16 months ago, and it has hooked me ever since. By education I am a historian and we have always viewed archaeologists with a certain degree of amused disdain. To a historian, comfortable in the ivory towers of academic libraries and offices with central heating and coffee machines, it is almost inexplicable why anybody would wish to spend weeks stood in a muddy hole on a barren windswept part of North Wales or the Outer Hebrides. Some historians, like David Tennant’s Doctor Who, can “point and laugh at archaeologists”. I should admit that I had participated in a couple of months of a “Dummies Guide to Archaeology” when I was at University so I had a miniscule grasp of it on one level. Besides, I had watched a lot of Time Team down the years which I found to be instructive, entertaining and occasionally hilarious in the way it takes best guesses and runs with them as total historical certainty! 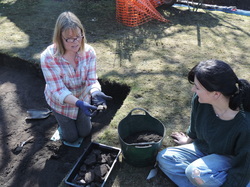 However, that was the sum of my archaeological experience when I decided to volunteer to work on the Merseyside Archaeological Society’s Rainford’s Roots project. With the confidence born of an academic background I downplayed the fact I had never been to Rainford. To be completely upfront I wasn’t entirely sure where Rainford was! I knew absolutely nothing about the existence of late 16th Century yellow ware or 17th century pipe making nor did I have the slightest clue that saggers (kiln furniture) even existed (beyond being the NATO code name for an old Soviet Air to Air missile system!). I didn’t do major research before joining up……actually I did no research at all! To National Museums Liverpool Field Archaeology Unit who host the project my lack of knowledge or experience was irrelevant. I was swiftly invited to join the Rainford’s Roots team, despite being a historian! I carried out the archaeological activities you don’t see Tony Robinson involve himself with, such as washing, sorting and describing each small sherd of pottery before entering it on a database and photographing it. I learned about Post Medieval clay pipes and pottery and their manufacturing processes from some very patient archaeologists and volunteers who actually knew what they were doing! I have always found these people useful companions in such endeavours. You are probably saying to yourself “Hang on a minute, wouldn’t trying to rebuild shattered pots drive you to return to being a historian?” Yes, under normal circumstances, it would! However the Rainford’s Roots project circumvents this possibility by having some truly remarkable team bonding. The make up of the team differs from session to session but is usually a mix of university students, keen amateur archaeologists, retired Rainford residents and “Usual Suspects” like me. Everyone is made to feel very welcome and accepted regardless of experience and there is a wonderful camaraderie that makes the whole experience enjoyable. I have made several strong friendships through this unlikely route. I have even been to Rainford! Rainford, it turns out, is a village just outside St Helens and much to my own disbelief I have actually taken part in digging in Rainford. I was able to enjoy the full “archaeological experience” because on the first day I attended the weather was terrible. I became cold, wet and quite miserable for the pleasure of unearthing the skeleton of an animal that has still not been convincingly identified to my satisfaction! I became wetter still by taking some serious building measurements whilst acrobatically trying not to fall into the strategically placed rosebush! On my second day on site (yes, I did persist with it) it was boiling hot, the trench was making no sense to anyone and just to keep up my skill of putting the “rain” into Rainford, the heavens opened just as I was about to head home. Has all this made me an archaeologist? No! I can now distinguish between a fragment of 1970s Coke bottle from a piece of 1650’s dark glazed pot and I can sound knowledgeable about the economic import of turf in Southern Lancashire (the “benefits” of aiding with background historical research to the project) but that still leaves me far from being a true archaeologist. 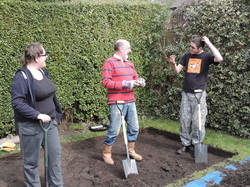 Would I recommend being involved in the Rainford’s Roots project? Yes, absolutely I would because it’s a great experience. Our outreach table. ©National Museums Liverpool. Rainford's Roots was at the Rainford Summer Festival at Rainford High Technology College this weekend! 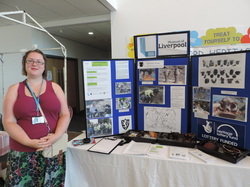 We had a display table near the school entrance to let local people know about the project and to show off some of the latest finds we've been discovering. We had a lot of interest, and more signed up to our emailing list. To see what else we have planned this month, see our events page for our Festival of Archaeology guide. 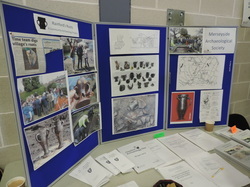 On Saturday 20th April the Rainford's Roots project came to Cheshire Archaeology Day, which was held in Winsford, Cheshire. 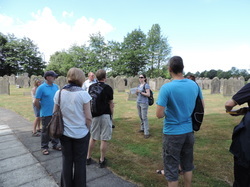 It was a great opportunity to make archaeology enthusiasts aware of the project and to gain people's interest. 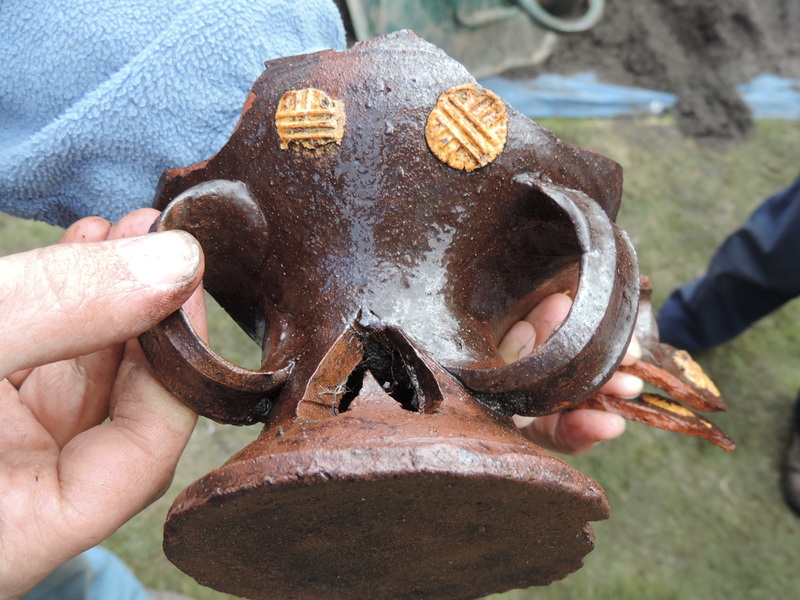 It also gave us a great chance to show off the results of our latest community excavation. There was a great turnout, with Society stalls from Greater Manchester, Cheshire, Merseyside, and Staffordshire. There was also a great array of talks by local researchers and curators. “What! Me do an archaeological dig, you must be joking.” “ Oh come on “ said my son “You know you’ll enjoy it”. Enjoyment is not a word I would associate with grovelling in the dirt, in wet and muddy conditions resulting in back ache and sores wrists and knees, but that is exactly what I did. I found myself on a dull morning at a house in Rainford, wondering just what I let myself in for. After being introduced to everyone, we were told what we were going to be doing, that a new trench would be opened to see if it would follow along the lines of the trench that was already being worked. So we got down and dug or to use the technical term "troweling”. At first it was just dirt upon dirt but then suddenly your trowel would hit something hard; was it a stone or could it be a piece of discarded pot, thrown away because of a defect in the making? Slowly but surely the trench revealed its treasures; a highly decorated pot lid, a squashed drinking pot, and my own find- the half of a pot with a handle nearby and the base of another pot- all at least 400 years old. Was it enjoyable? Most definitely. The staff couldn’t have been more friendly and helpful and they never made you think that you were wrong. Would I do it again? where’s my trowel! I left the house for my first archaeological dig thinking "What will I be asked to do? Will I be a help or a hindrance? Will my back hold out?" I was welcomed on site and given a site tour. Two large trenches had been opened and straight away we dived in with spades and shovels shovelling topsoil onto the spoilheap. Puffing and panting we lasted until tea break having checked each spade-full for any pottery fragments. After break the trench was cleaned and photographed. Until then I had no idea that soil could be so interesting. I even found out that archaeologists describe soils according to its colour, texture and content. What?! I kept peering down into the sand as Emma pointed out the subtleties to me. 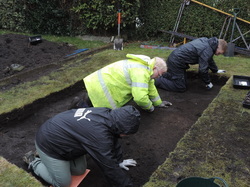 Our next task was to trowel the surface of the trench and we soon realised that nothing in archaeology can be hurried. A tantalising half of what looked like an intact pot protruded from the side of our trench but despite pleas from ourselves (the amateurs), it was left in section for recording. Amazingly though we found pieces of 16th century pottery, and some very early clay pipes practically every few minutes. The site was so rich in finds! Each time a corner of pottery emerged, we held our breath. It was entirely possible that Rainford's equivalent of a Greek urn would be revealed beneath the soil. But it wasn't. The archaeologists logged each area, the soil conditions, the position of the pottery and contexted the layers. Later on we got to wash some of the finds. We meticulously used toothbrushes to scrub each piece of pottery clean. I couldn't believe how rigorously trays and finds were labelled and cross-referenced. I thought archaeology was just about digging down, down, until some mysterious tribe decided to chase you out of tunnels and you escaped in runaway trains! And then we struck gold (not literally). A tiny corner of highly decorated pottery emerged. In our excitement we were told we had found part of a cup lid which had been made during the reign of Queen Elizabeth I. It even had tiny faces around the knop of the lid. The find of the day! My four days on site had started with good weather and very hard work. The physical demands of opening two sizeable trenches, without a mechanical digger, should not be under estimated. However, the job was soon completed and even us less youthful diggers survived the experience! The great thing about this dig was the quantity and variety of the finds. Even the top soil produced trays of pottery sherds, many with decoration and some almost complete. A highlight of my second day was Liam’s discovery of a decorated chafing dish, in pretty good condition. Since I was working next to him when he found it, I think it only right that it should be described as ‘our’ find! Although the finds were interesting in themselves, the most exciting aspect of the dig was the mounting evidence that we had to be close to the kiln itself. Not only was there large quantities of discarded pottery, but also we found an area of baked kiln bricks and a layer of compacted clay which extended about six metres. Although this clay layer was damaged in parts, probably by ploughing, Rob thought it may be the floor of a workshop or building, with a kiln at one end. So, gradually, layer by layer, we uncovered more of the clay, and found more evidence to support this theory, including bits of coal/charcoal and the first of the ‘plinth’ stones – which I found near the kiln bricks. This was a terrific dig and I really enjoyed sharing it with a great bunch of friendly and amusing archaeologists.